Whether fish sleep or not is a mysterious part of science which researchers are constantly trying to unravel. It is a given that fish, like all other living creatures, have to slow down their metabolism and body functions in order to rest. What also seems quite clear is that this “resting” phase is a bit different from sleep as is observed by most land based animals. It seems that, although fish do go into this “resting” phase, they do not shut down as many of their senses and warning systems as, for example, people. Due to the high risk environment they normally find themselves in it just makes sense to remain alert to different kinds of danger at all times. Most fish species have the same routines as us humans in that they are active during the day, but tend to take a rest at night. I have experienced it numerous times while on fishing trips that stretched from dusk till dawn. The best time for fishing, in my opinion, is late in the afternoon, during dusk and early evening, and for some predatory species (like sharks and cob) well into the night. However, round about 11:00 pm, in my experience, most fish lose interest in feeding anymore. Having said that, you can be sure there will always be exceptions to this rule. I compare those to certain people waking up hungry in the middle of the night and rummaging through the fridge for something to eat. During those above mentioned fishing trips fishing normally picked up an hour or so before sunrise, indicating that most fish species then awoke out of whatever form of slumber they have enjoyed and were looking around for some breakfast. Like mammals, birds and reptiles fish sleep in all sorts of different ways and in different locations. This can be either in big schools with a few “guards” keeping awake to watch out for any potential danger. Other species tend to hover in one place with the minimal of fin movement in order to keep them stable. Generally this will happen close to the bottom. Others can occupy all kinds of nooks and crannies in crevices, under rocks or in holes in river banks. Lots of fish species inhabiting coral reefs and other rocky outcrops tend to behave in this manner. I used to own a pair of clown fish at home in a tank for years and many a morning after switching on the light in their room, I observed at least one of them actually lying on its side on the rocky feature in their tank. They even looked a bit groggy! Some, like the sand lance (a type of sand eel), have neither pelvic fins nor swim bladders, hence their propensity to stay close to the bottom of the sea almost permanently. As their name indicates, they have a habit of burrowing into sand and, for all intents and purposes, we can assume they also sleep there. Some species just become stationery allowing the current to carry them at will with the occasional flick of fins or tail to keep steady. Regarding this phenomenon I have a personal experience which I briefly want to share with you. Years ago, during my student days, I used to go fishing with some guys on the Bushmen’s River in the Eastern Cape. We had a wooden boat with a small outboard engine and many an evening we anchored at some spot in the river to spend the whole night fishing, only to return back home after sunrise the next morning. During one of those outings, with no lights in the boat and the three of us trying to make us as comfortable as possible in a limited and quite cramped space, we heard “bumping” sounds on the side of the boat. Someone grabbed a flashlight and shone it in the water. To our surprise we saw dozens of small mullet just floating on the current, apparently in some restive state. However, when they got close to the boat (which they seemingly didn’t expect to be there), some of them suddenly “woke” up, got a fright and accidentally collided with the hull instead of avoiding it. We found it most interesting and pondered at the significance of what we observed. None of us were (or are) scientists, but I think we were not too far off the mark coming to the conclusion that those drifting schools of fish were definitely in some sort of restive state; probably the closest they got to sleep. And, how about this? Certain species of parrotfish have special glands inside their gills to secrete a type of mucus. This mucus then forms a type of cocoon which not only gives protection against parasites, it also masks their scent from prowling predators! I doubt whether there any other fish has attracted so much attention as sharks. On the one hand there is the sympathy they evoke when environmental journalists point out the huge slaughter that happens all over the world’s oceans annually when millions are killed purely for having their fins removed. On the other hand people are fascinated by sharks as perceived cold blooded killing machines; a distorted image exacerbated by Hollywood blockbusters like the “Jaws” movies. Be that as it may, we, surprisingly, still don’t know a lot of vital information about sharks. A controversy that has been raging for a very long time is the question whether sharks in fact do sleep. As most of us know sharks have no swimming bladder which means they have to constantly be on the move otherwise they sink. This is where they drastically differ from other bone fish species. They furthermore, and in order to procure oxygen, need to have a constant stream of water passing through their gills which also dictates that they (seemingly) can never have the luxury to be fully at rest for extended periods of time. But then one species of sharks namely the Nurse Shark (“Sand Tiger” in South Africa) seem to throw a spanner in the works, so to speak. During intensive studies by marine biologists these creatures seem to be able to park off on the sea bed for quite extensive periods, a phenomenon that had scientists scratched their heads in wonder and amazement. Further studies seem to indicate that some shark species, at least, developed the ability to have a constant flow of oxygen rich water across their gills even though being in a stationery position. It this is so, then the possibility of sleep amongst certain shark species, at least, seems a real possibility. However, as with most controversial issues in the scientific community this question will probably only be solved once more research is done and ample information is obtained. Zebrafish are common aquarium fish which can be found in homes all over the world. Not only are they a source of joy for their respective owners, they also attracted the interest of the scientific community at some stage. The fact that they possess no eyelids made scientists ponder about whether they then get any sleep at all. When scientists started studying them closer, they found that when zebrafish are taking a rest, their tails droops and they then spend the rest of the night either just beneath the water’s surface or at the bottom of the fish tank. Also during their studies the scientists bred mutant fish lacking in certain biological components which turned them into insomniacs. 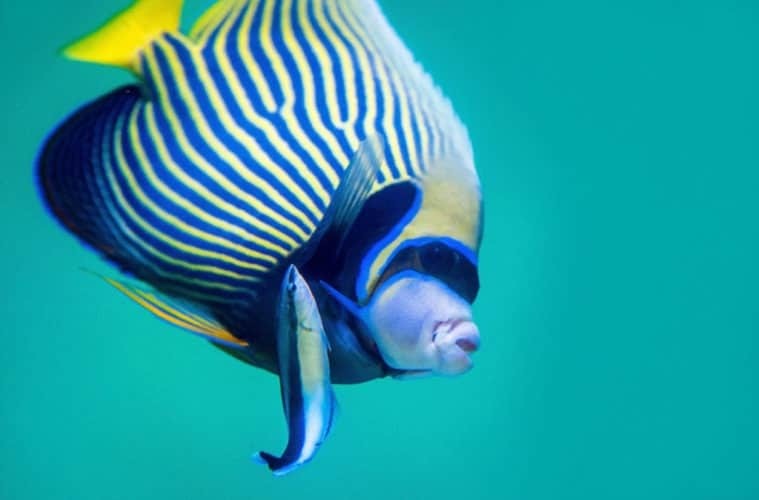 They further discovered that fish do take occasional naps and can also experience sleepless nights. Their findings are important for the study of human sleeping patterns and sleeping problems. It will, hopefully, shed further light on how to treat people with sleeping disorders like falling asleep constantly during daytime hours as well as insomnia and patterns of interrupted nighttime sleep. Being a keen fisherman and general lover of all things wild and wonderful has turned me into the kind of person who always wants to know more about how the other inhabitants of our planet conduct their daily lives. Where they live, what they eat, who they mate with etc. After years of not only reading up on different species, but also spending time in nature observing them, one tends to accumulate quite an impressive knowledge about your target species. In doing so, and as an avid angler, this knowledge generally comes in good stead when you embark on a fishing trip especially concerning the habitats, food, feeding patterns and routines of specific fish species. However, all things are relatively and, despite the fact that I undoubtedly learned lots and lots of things about fish and fishing in general over the span of a couple of decades, I am painfully aware of the fact that I actually still know precious little of the topic. This is truly humbling and, again, reinforces the eternal quest to spend even more time at the waterside observing and learning.